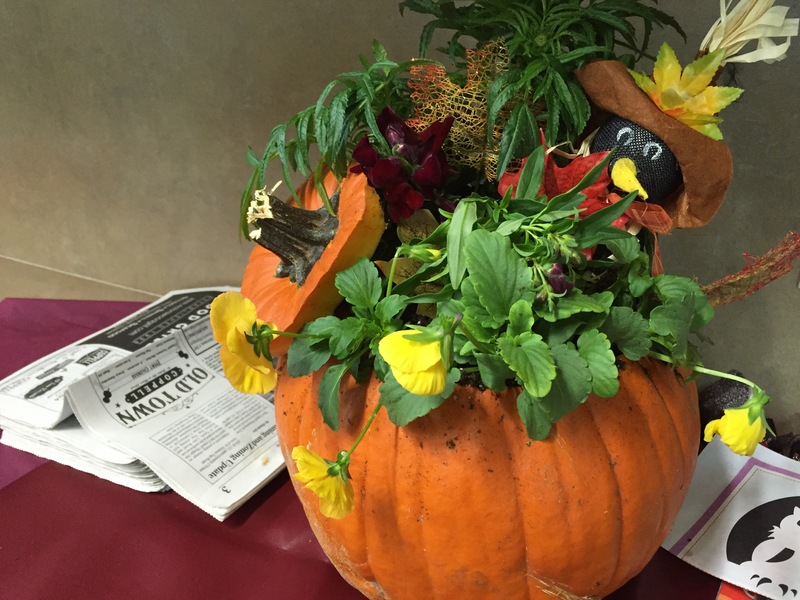 Pumpkin of choice – We used your standard Jack pumpkin, but you could also use more unusual pumpkins, like peanut pumpkins or Knuckle Head pumpkins, or even gourds – whatever you could imagine using as a vessel! 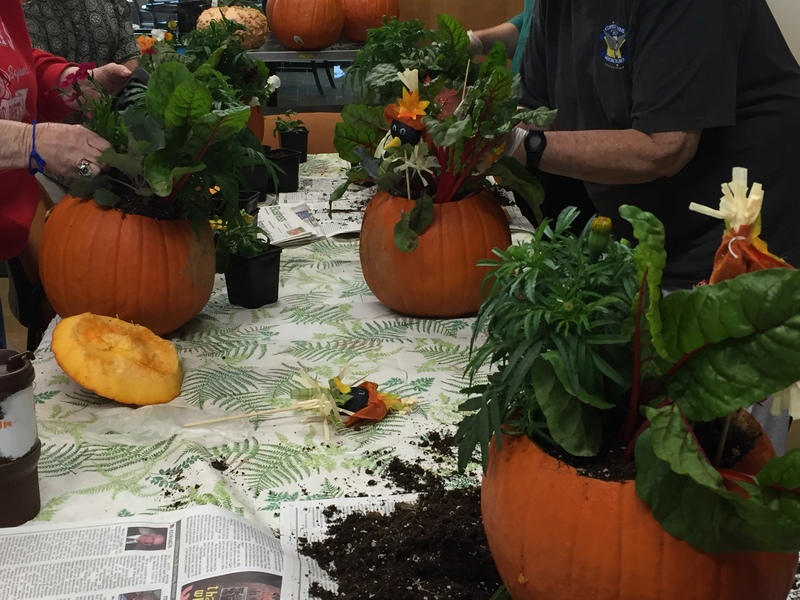 Plants – We chose from marigolds, pansies, dianthus, Dusty Miller, Swiss chard, ornamental cabbage, ornamental kale, and mustard, in 4″ pots. Carving knife – I prefer the carving utensils, with a cutting tool and scoop, sold for $0.97 at my local box store, over heavy duty knives. Though the handle for the cutting tool doesn’t have ideal ergonomics, it cuts in a sawing motion much easier than a knife, which can be bulky and awkward to handle. Carve a lid on top of the pumpkin, around the stem. You can carve fancy shapes into the lid opening, or a simple, circle shaped lid works too. Remove the lid. Use the carving knife to remove the pulp off the lid. Set the lid aside for future use or discard. 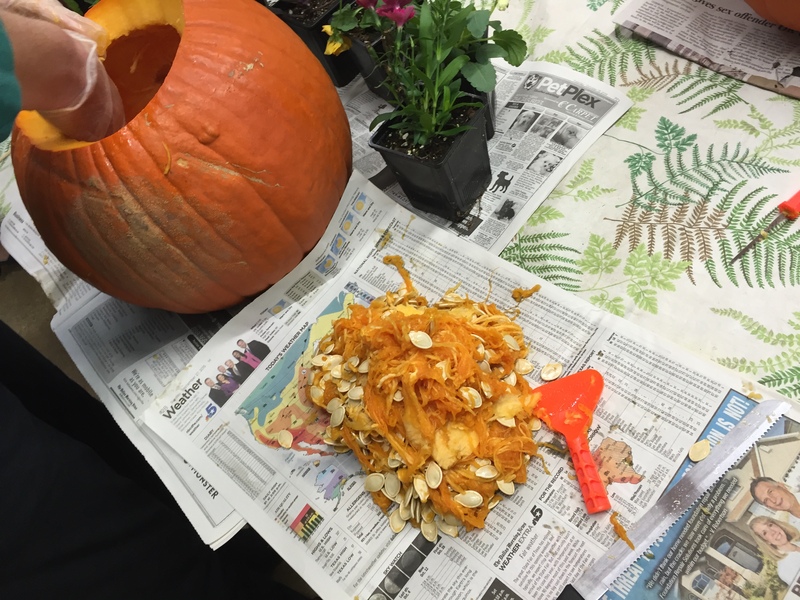 Remove the pulp and seeds out of the insides of the pumpkin and discard. Carve a drainage hole – about the size of a quarter – out of the bottom of the pumpkin. 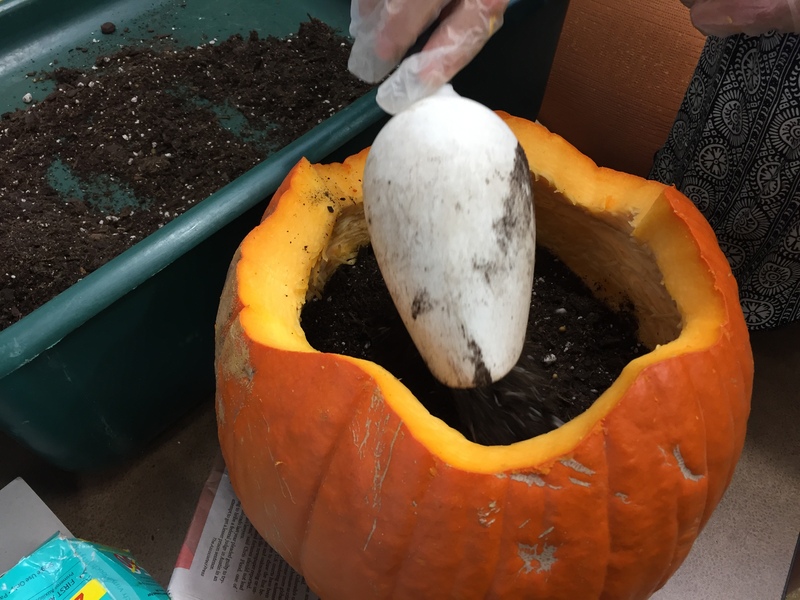 Plant the plants in the pumpkin. 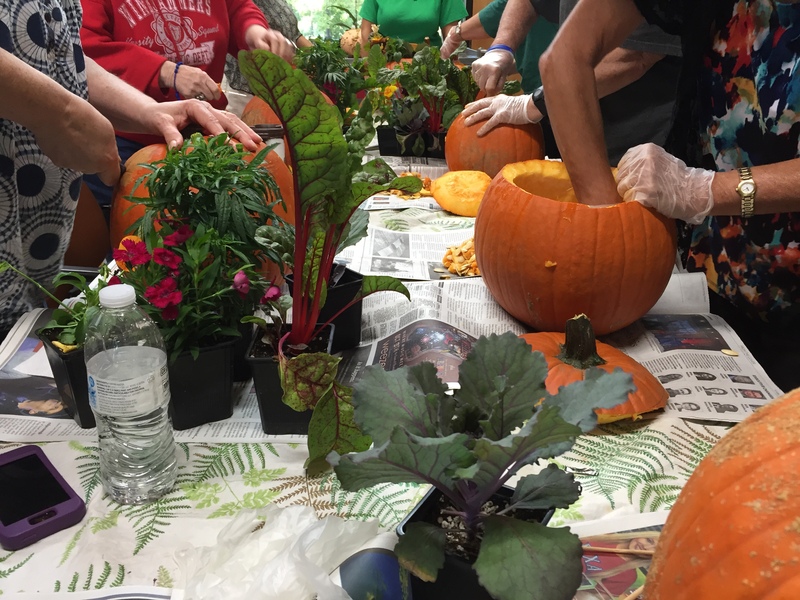 Optional – Add embellishments to the pumpkin. 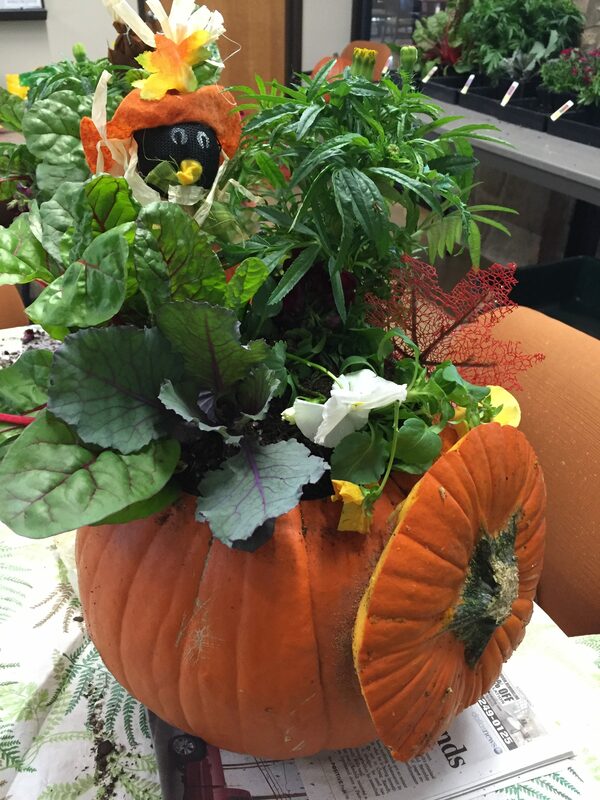 You can repurpose the pumpkin’s lid by affixing it with skewers to the outside of the pumpkin. (I inserted a couple of skewers to the outer wall of the pumpkin and then attached the pumpkin lid to the skewers.) OR, incorporate fall themed embellishments, like a scarecrow or spider webbing. 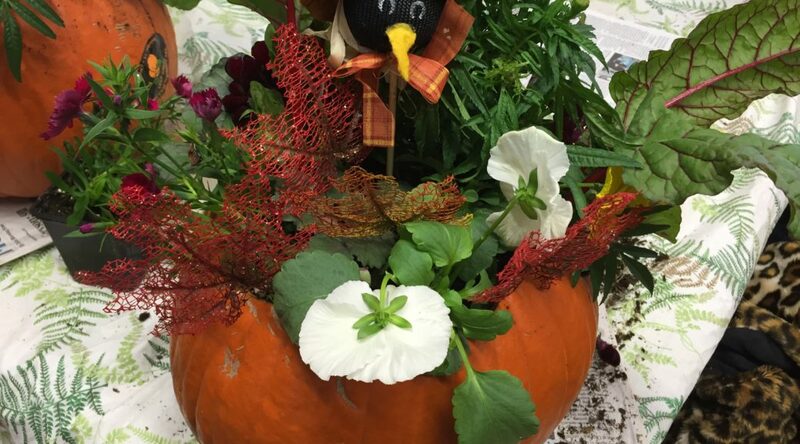 Place the pumpkin planter on a pumpkin stand. This helps to keep the pumpkin elevated off the ground, which can help slow down the decomposition process (a little bit). When your pumpkin really starts to decompose, pull the plants out and replant them to another location in the garden. Add the rotten pumpkin to your compost pile. Who knows? You may have some pumpkins pop up in your compost next year, and then you can start the process all over again.